The assortment of telescopes, binoculars, spotting scopes and astrophotography accessories offered by Orion's family of brands will enhance your viewing enjoyment without breaking the bank. Orion is proud to offer competitive pricing and a wide assortment of solutions for the amateur astronomer and outdoor optics enthusiast. This page is updated regularly to include any active offers, promotions, coupon codes, deals, discounts, rebates or other specials so you can shop with confidence that you're receiving the best possible prices. Please note that products in our Clearance Center and factory seconds do not qualify for shipping offers. Shipping offers are available only in the contiguous 48 states. Shipping offers do not apply to expedited shipping charges. Per-item shipping charges may apply to some products. This charge varies based on the shipping method. Order US $75 or more of Orion-, Meade-, and/or Tele Vue-brand products and your order will qualify for free standard shipping. To take advantage of this offer, your qualifying order must total at least US $75 before taxes or other charges. Select products from other brands receive free standard per-order shipping. Look for "Free Shipping" noted on these products. Orders of any binoculars, monoculars or spotting scopes we carry totaling more than US $75 will qualify for free standard shipping. To take advantage of this offer, the qualifying order must total at least US $75 before taxes or other charges. Orders shipping to Canada that total US $75 or more of Orion-brand products will receive a $9.95 shipping discount on their order. Binocular, monocular or spotting scope orders shipping to Canada that total less than $75 will receive a $4.95 shipping discount on their order. 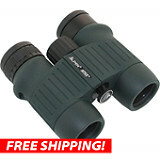 Binocular, monocular or spotting scope orders shipping to Canada that total US $75 or more will receive a $9.95 shipping discount on their order. We are excited to offer this alternative payment option for our valued customers. To qualify for Installment Billing, your order must total at least US $350 before taxes or other charges. If your order qualifies for installment billing, this option will be available for selection on the payment section of check out. Offer valid only on orders using credit cards issued in the United States or Canada with a billing address and contact information in the same country that the credit card was issued. Sorry, no debit cards. Your credit card will be authorized for the full order amount to verify creditworthiness and ability to pay. Upon shipment of your order, your credit card will be charged three monthly installment payments. Applicable shipping and handling charges will be added to the first installment payment. Note: Destinations in California, Colorado, Georgia, Hawaii, Illinois, Indiana, Iowa, Kentucky, Louisiana, Maine, Michigan, Minnesota, Nebraska, Nevada, New Jersey, New York, North Carolina, Oklahoma, Pennsylvania, Rhode Island, South Carolina, Utah, Vermont, Washington, West Virginia, and Wisconsin will also be charged state sales tax. If credit card authorization is declined at any time, the Installment Billing Offer is rescinded. Please note that Build-A-Scope telescopes, non-Orion brand products, Gift Certificates, E-Certificates, and Clearance Center items do not qualify for our Installment Billing program, and all products on your order must qualify for your order to be eligible for the Installment Billing program. We are excited to offer this additional alternative payment option for our valued customers. To qualify for our Layaway program, your order must total between US $99 and US $5,000 before taxes or other charges. If your order qualifies for our layaway program, this option will be available for selection on the payment section of check out. Alternatively, you can place a layaway order by calling Orion's customer service department at (800) 447-1001. Full details regarding layaway procedures can be found here. If you're looking for an affordable telescope to start off with, or a great deal on a grab-and-go setup, Orion has what you need, priced to please. We've put a wide variety of excellent introductory telescopes on sale, but supplies at these low prices are limited, so shop and save today before all the deals are gone. Treat yourself to great astronomy gear and save with deep discounts on select telescopes, binoculars, and accessories in our Clearance Center*****. HURRY - all items are limited to stock on hand. For out-of-this-world savings on astronomy gear, enter the Orion Deal Zone! We've made it easy to shop in one convenient spot for top-notch astronomy equipment at unbelievably low prices. You never know what you'll find in the Orion Deal Zone — so check back often before all the great deals disappear. Save on select telescopes on sale today! Whether you're a beginner just starting out, or an experienced amateur astronomer, Orion has the right telescope for you. Shop Orion Telescopes on Sale! Take your shot, and save! We have a wide variety of discounted astrophotography gear that can help you capture amazing images without breaking the bank. Shop Orion Astrophotography on Sale! Find eye-opening deals on select binoculars, monoculars and spotting scopes right here. You'll get great gear at amazingly affordable prices! Shop Orion Binoculars on Sale! Enhance your observations with select Orion accessories on sale. From filters and eyepieces to Barlows and cases, we've got everything you need! Shop Orion Accessories on Sale! * Products in our Clearance Center and factory seconds do not qualify for shipping offers. Shipping offers are available only in the contiguous 48 states. Shipping offers do not apply to expedited shipping charges. Per-item shipping charges may apply to some products. This charge varies based on the shipping method. Flat-Rate Per-Order Shipping on Binoculars and Monoculars offer is not valid for phone orders. ** Discounts apply only to products listed on their respective pages. Prices valid only while supplies last and are limited to stock on hand. Sale products are limited to two units per customer. Large volume orders are subject to special order policies, contact our Customer Service Department for additional details. *** Free gift with purchase offers only apply to purchases of products listed on their respective pages. Valid only while supplies last and limited to stock on-hand. Free gift offers are not valid for phone orders, through the Orion retail store, or through Orion dealers. Limit one gift per customer. Free gifts are not eligible for Orion's price guarantee. **** Installment Billing offer is valid for Orion-brand products only. Offer not valid for items in Clearance Center or on Gift Certificate or E-Certificate purchases. *****Products in our Clearance Center are discounted, fully functional, but possibly blemished factory "seconds" and discontinued new astronomy gear. All Orion Clearance Center purchases are covered by our one-year limited warranty and 30-day money back guarantee. Please Note: Promotions, such as free shipping and free gifts with purchase, are offered for consumer order quantities and not large volume orders. Large volume orders are subject to special order policies, call for additional details. Offers may not be applied to orders in process, previous orders or combined with other offers. All prices and/or promotions are subject to change without notice.